Get ready to set that Thanksgiving table. Ah, Thanksgiving – the holiday that toasts America’s richness and bounty as no other. When we think of the loving labor that goes into preparing dinner for relatives and friends, it can anything but a holiday. The Thanksgiving table allows us to keep the day special, beautiful, and relaxing without being stuck in the kitchen. Whether you’re having a San Diego style get-together, celebrating somewhere in the country, or somewhere in between, holiday decorating should be consistent with your personal style and the look of your home. Classy Thanksgiving tables are all the rage. The focal point for any dining room is the table. How well you dress your dining table can transform your dining room from day to night, or season to season. Starting ahead of time will help keep things organized in preparing your table for the Thanksgiving gathering. One of the biggest pleasures of entertaining for me is dressing the table. I love to spend time experimenting in setting what I think will be the perfect tablescape – from the dishes to the centerpiece to the candles, even the background music. Staging the table sets the tone for a special meal. When you lead guests into the dining room, you want them to see a beautiful, inviting place that you, the hostess, created to make them feel special. Today, tableware, linen, flatware, serving dishes, plates and glassware come in many intriguing colors, shapes, styles, and materials. The choices are virtually endless when choosing a scheme for your Thanksgiving table. Presenting your favorite collection in a creative, imaginative way, makes the difference between a so-so meal or an unforgettably elegant and charming one. Linens, in any table setting style, define the look of the dining table. For a formal, traditional table, using white or off-white, usually works best. Heirloom, or fine china, sterling silver flatware, and fine crystal are expected at a formal table. Other elegant touches to build on might include oversized, textured chargers in a metallic finish. Mixing sterling and other classic touches add a luxurious element to a formal table. Decorative place cards are often used to give a warm welcome to guests. It’s fun to mix modern touches in a formal setting. A soft, fresh floral arrangement in a modern clear bowl or vase, or a more earthy arrangement using greenery and fruit can contrast a classic formal setting. There are hard set rules to break about table setting style, so it’s always challenging and fun to pare down a formal adaptation as to not risk being too stuffy. Haviland Laque de Chine, anyone? 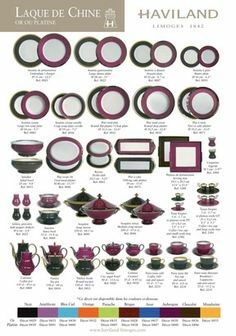 One of my favorite lines of fine china is Haviland. Haviland has been manufacturing French porcelain china at its factory in Limoges, France since 1853. I spoke with their National Sales Manager, Maureen Ferrel, to find out what the latest trend is at Haviland. In a more casual, rustic setting, centerpieces and other table decorations should celebrate nature. The simplest arrangements using pumpkins, gourds, apples and nuts, along with fresh floral and greenery work well. Baskets, pottery, or terracotta containers work best for their textures and country feel. These special touches make us feel thankful when we sit down to the Thanksgiving table. 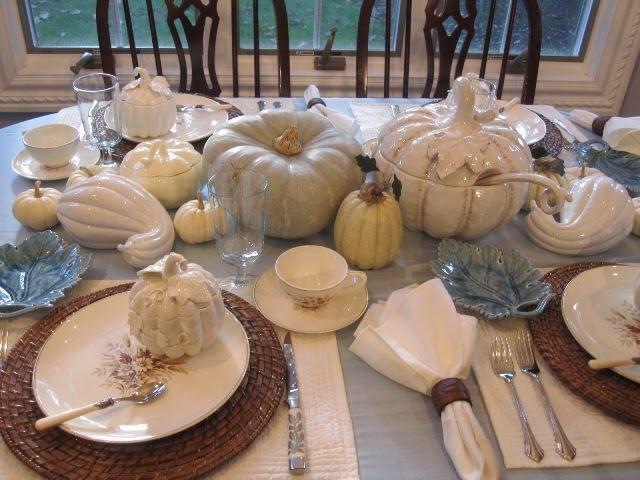 A rustic Thanksgiving table demands earthenware, stoneware, and ceramics as opposed to china. Wood accented flatware is wonderful when pared with these dishes, however silver seems to always go with everything, as silver adds a little sparkle to any table. Other elements for the dining room should be lots of soft lighting, votive candles, and even a crackling fire in the fireplace, would blend to create a gracious, relaxed, elegant setting to enjoy your Thanksgiving feast. Eating and drinking should be reveled in and make most of the celebrating feeling thankful. May your Thanksgiving table, whether formal or rustic, be simply stunning, and the day enjoyed by family, friends, fabulous food – and plenty of football!